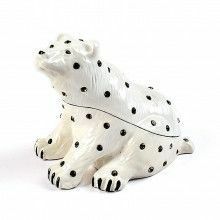 This cute trinket box features a couple of teddy bears giving each other a nice big hug! The bears open up at the waist, revealing a small area to keep tiny things. Especially great for baby's memory keepsake. This trinket box also makes a great paperweight, as it is a little heavy. It is also made from pewter, and has been decorated with gold plating and a few crystals.